Published: Dec. 6, 2011 at 12:17 p.m.
Stanford guard David DeCastro is considered to be the best interior lineman in college football. 1. Matt Kalil*, USC, OT, (6-7, 295): Kalil is the most polished offensive tackle in college football. He possesses unique skills to match his imposing frame and shows all of the signs of blossoming into an all-star caliber player at the next level. He was so respected by the USC coaching staff as a left tackle that they kept current Cowboys tackle Tyron Smith on the right side despite his extraordinary talent. 2. Riley Reiff*, Iowa, OT (6-6, 300): Reiff could be the next dominant Iowa offensive tackle to make an immediate impact in the NFL. He combines exceptional physical tools with a refined game that allows him to dominate defenders on the edge. Reiff's value is helped given the success of Bryan Bulaga and other ex-Hawkeye linemen. 3. 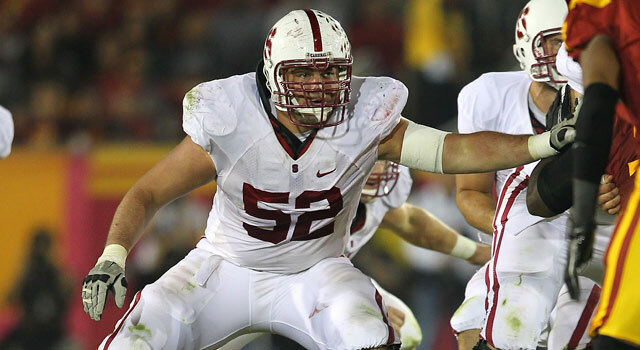 Jonathan Martin*, Stanford, OT (6-6, 304): Martin could be the most athletic edge blocker in college football. As a natural left tackle with outstanding movement skills, he shines in pass protection and equally is adept at grinding in the ground game. Although scouts question his aggressiveness and toughness, Martin's raw talent will win out. 4. David DeCastro*, Stanford, OG (6-4, 304): DeCastro is the complete package as an interior blocker. 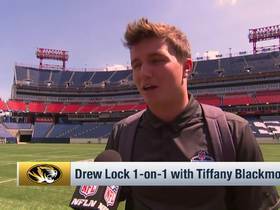 He is smart, tough and physical and possesses the athleticism to assimilate into any offensive system. When scouts closely examine the success of Stanford's running game, they will fall in love with DeCastro's superb play at the point of attack. 5. Mike Adams, Ohio State, OT (6-6, 320): Adams missed five games due to an NCAA suspension for his role in the Ohio State memorabilia scandal, but he has displayed the athleticism and skill to be a quality NFL left tackle. His combination of size, strength and athletic ability makes him an intriguing talent worthy of discussion as a potential high pick. 6. Cordy Glenn, Georgia, G (6-5, 348): Glenn is a mountain of man with extraordinary movement skills for his size. He ideally is suited to anchor the interior of the line at a guard spot, but has displayed versatility by playing left tackle for the Bulldogs. With big, physical blockers valued at a premium, Glenn is certain to attract significant attention in the pre-draft process. 7. Zebrie Sanders, Florida State, OT (6-5, 307): Sanders has displayed the kind of versatility that scouts covet this season by transitioning from right to left tackle following a season-ending injury to Andrew Datko. As a big, physical edge player with strength and power, Sanders is an ideal right tackle prospect with the potential to pay immediate dividends. 8. Levy Adcock, Oklahoma State, OT (6-5, 322): As an underrated athlete with sound footwork and fundamentals, Adcock is an intriguing prospect ideally suited to play on the right side as a pro. He has extensive experience in pass protection in the Cowboys' spread system but also shows up well in the running game. Although his game ranks a notch below some of his counterparts, Adcock certainly will experience a run up the charts due to high value at the position. 9. Kelechi Osemele, Iowa State, OG (6-5, 347): A massive blocker with explosive strength and power. He has spent most of his collegiate career playing out of position at tackle, but his ability to maul defenders at the point of attack makes him an ideal fit at guard. While his inconsistent motor rates as a concern, his ability to win within tight quarters makes him a highly regarded guard prospect. 10. Ricky Wagner*, Wisconsin, OT (6'6, 320): Wagner has all of the tools to blossom into an all-star caliber player as a pro. His combination of size and strength shines in the run game, but he equally is adept at stifling rushers in pass protection. With sound technique to match his superior physical tools, he could be an intriguing prospect if he declares for the draft.